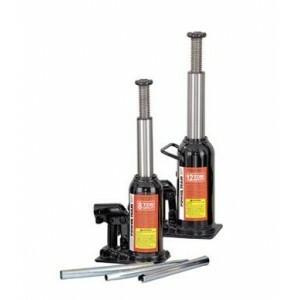 A hydraulic jack is a lifting mechanism in which force is applied through the mechanism of a hydraulic press. A hydraulic jack is operated by utilizing a liquid, normally oil. The jack acts against a piston where a small force applied by a lever attached to a small piston, produces a very large force on a large piston, allowing for greatly enhanced lifting. Hydraulic jacks are utilized in industrial lifting and pushing applications, with capabilities from 2- 110 tons and can operate both vertically and horizontally.